You can Share/Publish your project and fully manage it for web or online use. Not only can you publish your project and access via URL which you can email or direct users to it, you can also share it on your favorite social networks or embed it to a website. You can also manage various aspects in advanced settings menu. Once you are done with your project. You may want to publish it. To do so, click Share at the top right of the screen. A full-screen Share Online page will pop up. You will see three options: Publish for Web, Share Privately and Embed. To know which option you choose, you would first need to know what you want to do with your project. Publish for Web: You would choose this option if you want to make your project public. Once you clicked on Publish for Web, it will lead you to a page where you can edit the title of your project and add description. When you click on Publish to the web, it will generate a URL link for you to share it online with other people. Anyone with the link are able to view it. Click here for FAQ’s on Downloading and Publishing Projects. If you would like, you can also share your project on social media such as Facebook, LinkedIn, Twitter, Google+, Twitter and Email. If you want to share a project on social network or to email it to someone, click on any of the desired shared options. Let’s say you want to share it on Twitter, click on the Twitter logo and it will open a new window which directs you to Twitter page. 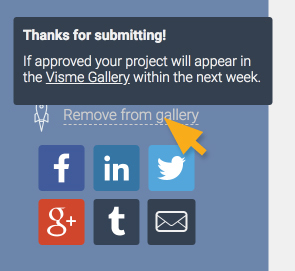 You can also submit your project to Visme gallery. You can also remove from gallery. To stop publishing, simple click Stop publishing next to the URL link. Share Privately: You would choose this option if you want to make your project private so only people you give access to can view it. What that means is that you can create a password for your project. In order for anyone to view your project, they must enter a password that you set. Learn more on how to make your work Private. Embed: You would choose this option if you want to embed your project to the website or blog. This preserve updates to your content with no downloading required. For this one, you would need to make your project public before embedding it to your website. If you haven’t already, click Publish to web. You can then copy and paste the html code to the website in which you want your project to show. 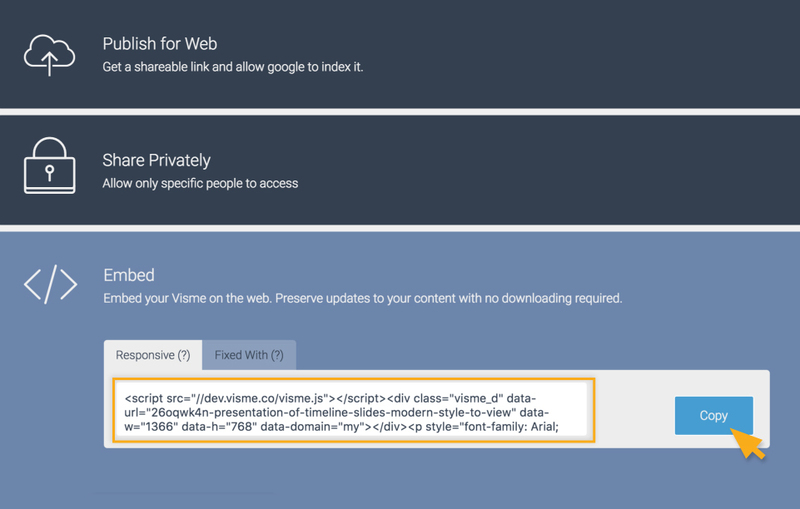 Click here for full details on how to embed html code to your own website or blog. Tip: You can keep updating your project and share/publish it again as needed. You can also fully manage various aspects of your published project and its settings.